Congrats to Core 6 Athletes Class of 2016 OL Erik Swenson from Downers Grove South who committed to #Michigan last night. "He called up the coaches at Michigan and gave them his verbal commitment," said Swen Swenson, Erik's father. "It's his dream school and I honestly couldn't see him going to any other school. He wasn't going to travel all over the country when he had already found the school he wanted to attend." "Erik is just a pretty simple kind of kid. He's not into traveling across the country and doesn't want to take official visits and waste people's time and money. He has wanted to go to Michigan since he was a little kid. He truly had no desire to go anywhere else. He loves the school, the tradition and everything that is Michigan. He will get a great education and will get a chance to play at a high level. My wife and I just could not see him at any other school. Michigan has great people in and around the program. Erik was ready to commit at the Notre Dame game but I wanted him to slow down just a bit and really think it through. He said to me this weekend "I'm done" and I believed him." That is what we call a "firm commitment" in the biz. Every recruit that commits from here on out will have vow to this statement after committing before I can allow it. No exceptions recruitaholics!! 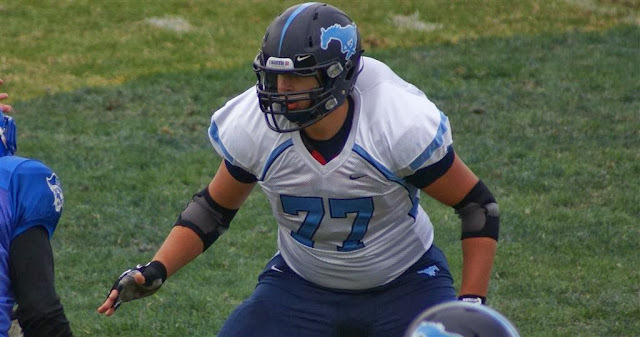 Downers Grove (Ill.) South offensive tackle Erik Swenson has been on the radar since his 8th grade season because of his unusual size. Now standing 6-foot-7, 290-pounds, he is in his second season of varsity and more than holding his own. To show for it, he already holds early offers from Ohio State, Michigan, Notre Dame, Illinois and others. Swenson's commitment is a monster (literally & figuratively) start to the '16 class. One that could be monumental in building another stellar class. Look for Swenson to be a big recruiter down the road, who's ready to start this weekend at The Game. There were some big fish who jumped in early alongside Michigan: Illinois, Northwestern, Notre Dame, and Ohio St. This one is tough. I've never had to think this far in advance! That's the scary part I guess. Hoke and co. have a commitment who could compete for a starting spot right now. Just imagine how fine-tuned this kid will be in two more years once he hits campus. Then the sky is the limit. Not like the kid has a #77 jersey hanging in his room or anything (he really does).